More than five months after the IPCC was accused of making assertions on the fate of the Amazon forest on the basis of a non-peer reviewed WWF report, it now appears that the original source of the IPPC's claim is a Brazilian educational website which was taken down in 2003 (pictured - click to enlarge). Furthermore, it appears that this is the only source of the IPCC's claim that made up the basis of "Amazongate" – that the IPCC was, once again, using unsubstantiated material which exaggerated the threat. This website, therefore, is the "smoking gun", the latest evidence to suggest that the IPCC is breaking its own rules. Interestingly, when the "Amazongate" story was broken on this blog on 25/26 January, we had no way of knowing that the trail would eventually lead to a defunct Brazilian website. It was the official denials of our story that gave the clue, and they did not really get underway until 31 January when The Sunday Times published its report headed: "UN climate panel shamed by bogus rainforest claim,"
Then the paper had charged that the IPCC warning that global warming "might wipe out 40% of the Amazon rainforest" was based on an unsubstantiated claim made in a WWF report. This evoked from the WWF a press statement standing by "the credibility of its report", a Global Review of Forest Fires (2000). Starting with the IPCC claim that: "Up to 40% of the Amazonian forests could react drastically to even a slight reduction in precipitation," this had been referenced to the WWF report which asserted: "Up to 40% of the Brazilian forest is extremely sensitive to small reductions in the amount of rainfall." 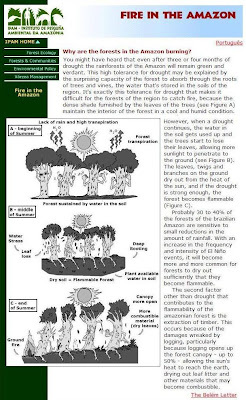 Now, the WWF was claiming that the source for this statement was "Fire in the Amazon, a 1999 overview of Amazon fire issues from the respected Instituto de Pesquisa Ambiental da Amazônia (IPAM – Amazon Environmental Research Institute)." The source quotation read: "Probably 30 to 40% of the forests of the Brazilian Amazon are sensitive to small reductions in the amount of rainfall." The claim was repeated on 7 February in a Sunday Times letter from David Nussbaum, the chief executive of WWF-UK, who then used a curious form of words. "This," he asserted – referring to the Fire in the Amazon statement - "is fully supported by peer-reviewed literature." Contrary to the Sunday Times's "suggestion," it was not a "bogus" claim. Nussbaum did acknowledge, however, that a reference to Fire in the Amazon as the source of the 40% claim was omitted during the editing of the Global Review of Forest Fires. The lead author of the report, Andrew Rowell, also pitched in, again using a curious form of words for his contribution. The paper, he claimed, had "ignored credible evidence" that the 40% figure was correct and "also ignored evidence that the figure had been backed up by peer-reviewed research both before and after our publication." Even then, careful textual deconstruction indicated that no one was actually asserting that the source of the 40%, Fire in the Amazon, was actually peer reviewed – merely that it was "supported" or "backed up" by peer-reviewed work, the exact nature of which was always somewhat vague. We were thus able to charge that Fire in the Amazon was not itself peer reviewed, thus arguing that the IPCC was relying on a WWF report which was not peer reviewed, which in turn was relying on another document which was also not peer reviewed. The emphasis, however, was on a document and there was nothing to indicate otherwise, even though – also in early February – Daniel Nepstad claimed that the IPCC statement on the Amazon was "correct", but the citations listed in Global Review of Forest Fires were incomplete. He added that the authors of this report "had originally cited the IPAM website where the statement was made that 30 to 40% of the forests of the Amazon were susceptible to small changes in rainfall." Therefore, the assumption was that the WWF's claimed source was the only significant IPAM publication of 1999, a document entitled: "Burning Forest: Origins, Impact and Prevention of Fire in the Amazon". This, though, presented problems in that the claim apparently attributed to it by the WWF did not appear in any of the three versions. Now, however, the website to which Nepstad referred has been recovered. This is the real "Fire in the Amazon" (pictured top left). It seems to have been posted on the IPAM website in February 1999 and left unchanged until early in 2003s, when it was removed. See publication log via the link (illustrated above - click to enlarge). Here, at last, we find the exact sentence "Probably 30 to 40% of the forests of the brazilian (sic) Amazon are sensitive to small reductions in the amount of rainfall." This is the source of the WWF claim and, ultimately, the source of the IPCC claim. As it stands, this is the only known source of this sentence. There is no author identified, the provenance of the web page is not identified and not in any possible way could this be considered "peer reviewed". It has no academic or scientific merit – yet it is this on which the WWF and IPCC apparently rely. What is also particularly important is that the IPCC uses the sentence, which it modifies slightly, to argue: "this means that the tropical vegetation, hydrology and climate system in South America could change very rapidly to another steady state, not necessarily producing gradual changes between the current and the future situation." By contrast, this very specific claim about reduced rainfall is not used on the IPAM site to argue that the forest will undergo a rapid change from one state to another, per se. 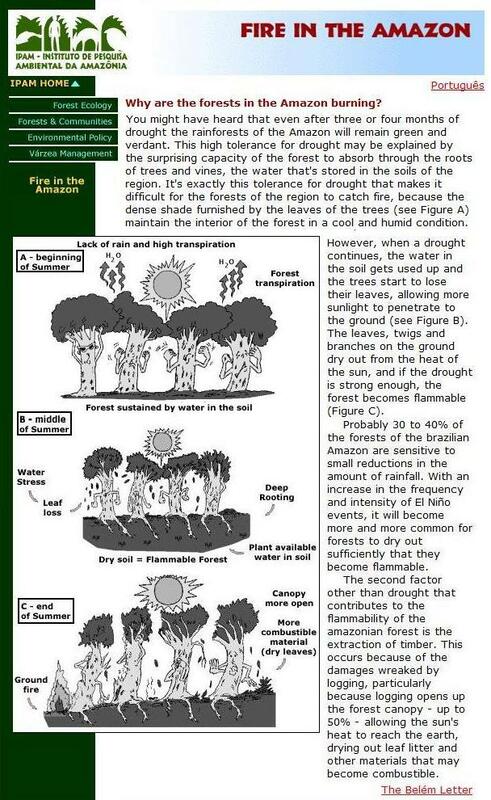 The context is in the title: "Why are the forests in the Amazon burning?" It explains why forest flammability has increased. Thus, not only is the primary IPCC claim unsupported, so it its interpretation. Yet, despite this, The Sunday Times has been prevailed upon to retract its report, removing an article which was essentially correct in alleging that the IPCC claim is "unsubstantiated". In its place, it has substituted what amounts to a lie, asserting that "the IPCC's Amazon statement is supported by peer-reviewed scientific evidence." It would appear now that the WWF must explain why it is relying on data culled from the IPAM website to support its report. It must also explain why it is using material which has no academic or scientific value, while giving the impression that the material is fully supported. Similarly, the IPCC must tell us how it can justify the claims it has made, in breach of its own rules.